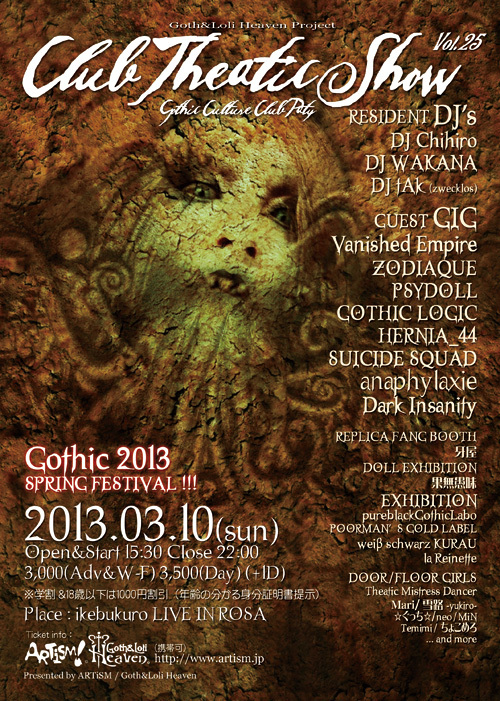 Tokyo Goth Event :: Club Theatic Show :: March 10, 2013! I still have not had enough time to get into the site yet, but this event is too good not to mention! 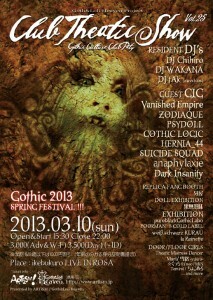 On Sunday March 10 from 3:30 pm, the Goths will be invading Ikebukuro Rosa Live Inn in Tokyo! Organizers are calling this Gothic 2013 SPRING FESTIVAL, and festive it is! Featured bands include Psydoll, Vanished Empire (DJ Chihiro and 2Bullet’s Dee Lee), Suicide Squad, Dark Insanity, Zodiaque, Hernia_44, PeaceToPieces and Gothic Logic! There will also be DJs Chihiro, Wakana and tAk, along with exhibition space, fang makers, dancers and more! THIS IS NOT AN EVENT TO MISS! * If you want to book just do a quick search of the band and send them a mail – Psydoll or Vanished Empire (via 2Bullet’s Dee Lee) should be cool. Any problems? Buzz me and I’ll see what I can do! Just a handful of days to this event… If you are in Tokyo then head on out to Ikebukuro Rosa Live in on Sunday for a beautiful day of live and DJ’d Japanese Goth! Thanks for asking! As far as I know nothing has happened to Gothers. The Gothers goth community still continues as always, and there are a few new people joining each day. There were issues with the hosting company for a while that meant the site was loading slowly (or just didn’t load sometimes – hmmm…), but those problems have disappeared now. All is good and we are bubbling along.